Facebook is clearly the largest of all social media platforms. People who use Facebook spend almost an hour on it each day. With Facebook ads and Pages, you can make sure your marketing message gets out to the maximum number of potential new customers. How effective can Facebook be for prospecting clients for new business? Very effective! 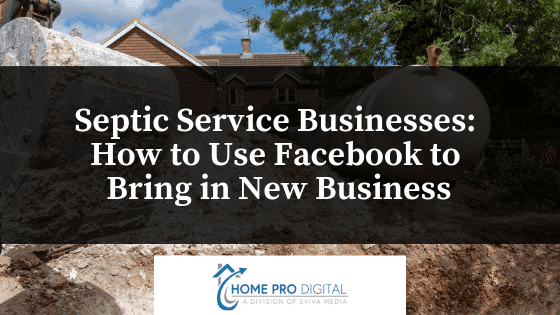 If your septic service company already has a Facebook Page and marketing plan for your existing customers, it’s also easy. You can do a few things to adjust your strategy to include getting new customers. Post regularly – One of the best ways to make sure people tune in to your Facebook Page is to regularly post content. We recommend posting at least three times per week. This may seem like a daunting task at first, but there are many types of posts you can use to stay on top of your follower’s mind. This includes tips for septic homeowners, articles about your industry, and community news. Using Facebook analytics, you can scan info regarding the best time of the week and the day to post; helping you reach the most people online at the time. Posting more times per week not only increases the odds of something from your page being seen and clicked on, but it sends additional traffic through links for your original website. Post engaging content – It can be discouraging to work on content that simply doesn’t get seen or read. Of course, you need to make sure you post strategically at certain times and on specific days. You should also post ads that are properly targeted. You can get help with your content being circulated as you develop an interested and loyal following of regular readers. Engaging content encourages your followers to interact with your material by participating in campaigns and events, and by sharing it with their friends and family. Reviews, humorous stories, news from their own community, positive memes, colorful photos of your work, trivia contests, promotions, and satisfied customer testimonials develop credibility and build a relationship with old and new customers. Become the local septic system industry experts – When you post regularly regarding relevant information your community clients are interested in, you develop a reputation for knowing what you’re talking about. Sharing useful information, tips, and answering frequently asked questions can establish you as the “go-to” company for answers and services for their septic system issues. Regular reminders about maintenance, community news, and involvement will keep your septic service company on their minds. Effective targeting and advertising boosts – While regular posts on your Page are useful, it’s true only a small percentage of your followers might automatically see your posts in their feed. Facebook allows you to create specialized ads and even boost posts for nominal fees. These boosts get your posts or ads circulated far more widely using parameters you setup. You have control over what you spend and how long the ads are boosted. Not only can you send ads out to targeted followers, but to other people who fit those parameters. Setting up your Facebook Page and maintaining it effectively can take a lot of your time. As a business owner, you’d probably rather spend time growing the business itself. You may also find keeping a marketing calendar difficult to keep track of. Home Pro Digital understands how to help your company stay current and effective with its marketing goals. That’s why we offer our DIY social media packages for septic service companies. Don’t wait another day to develop new customers. Contact us today to discuss your goals for getting new business through Facebook.